Another month has come and gone, and that means it's time for another Secret Recipe Club reveal day! This month, I was assigned to Fran's Favs, written by Fran, of course, who describes herself an "Italian Foodie" who seems to be winning the contest of who can collect the most cookbooks (she has over 300)! A mother of 4 grown children, Fran seems to have one of the coolest jobs around; she works with flavor scientists and technologists who develop flavors for food companies! If that isn't the best fit for a food blogger, I don't know what is! Anyway, as soon as I got the assignment this month, I went right to her blog and read it from beginning to end, just as I always do. I found many different recipes that I thought sounded great, but this one stuck out the most. Since Joel and I have been wanting to incorporate different grains into our diet, I figured it was a sign to give quinoa a try (again). See, me and quinoa got off to a rocky start. The first time I made it a few years ago, it was super mushy and kind of gross. The next time I made it a few months ago, it burned and stuck to the bottom of the pan, forcing us to go out for dinner. The third time, I made Joel do it, and I am convinced it wasn't cooked quite well enough because it was slightly crunchy. So, fourth time's a charm? Yes, it was! I cooked the quinoa according to package directions using chicken broth (I know that doesn't make it vegetarian, but you can substitute water or vegetable broth) and it turned out perfectly! I am officially a quinoa lover. After mixing these patties and pan frying them, the first batch came out perfectly. 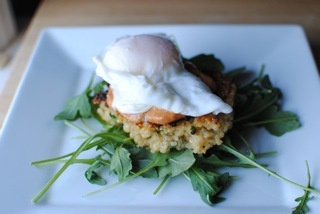 They had such a great flavor, and with the egg on top, it gave the quinoa patties a richness when the yolk broke. I enjoyed how quickly this meal came together, and how simple, yet delicious, it was! Thank you for sharing, Fran! In a medium bowl, combine the quinoa, eggs, salt, chives, shallots, parmesan, and garlic. Stir to blend. Mix in the bread crumbs and stir gently until evenly incorporated. Form the mixture into six evenly sized patties, about 3-4 inches in diameter. Heat the oil in a large sauté pan over medium-high heat and swirl to coat. Add the patties to the pan so that they are not touching (it is best to do this in batches). Cook for about 4 minutes, or until the first side is lightly browned. Carefully flip the patties with a spatula and cook the second side until it is golden brown, about 3-4 more minutes. Repeat with remaining patties, using additional oil if needed. To serve patties, top with shaved parmesan, a poached egg, and salt and pepper.